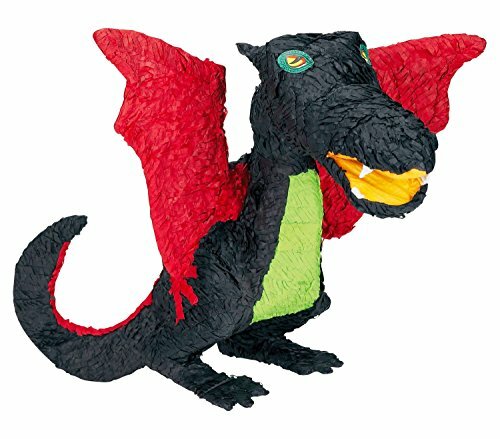 Have a fire-breathing good time at your birthday celebration with the Dragon Pinata. The 7 inch x 18 inch x 19 inch is sure to make for exciting scary fun. No filling included. A standard size pinata holds a recommended limit of 2 lbs. of candy. How do I insert the candy into the pinata? On each pinata there is a clear sticker labeled “Insert candy here.” Under that sticker and a layer of tissue, there is a pre-made hole. Press sticker or use scissors to create an opening. What is the best way to hang the pinata? All pinatas have a built-in hang loop at the top. This loop should be used to hang the pinata from a sturdy support, away from anything fragile. Adult supervision is strongly recommended.